The 1926 Rossland Miners who defeated the Vancouver Young Liberals to win the BC Senior A title. 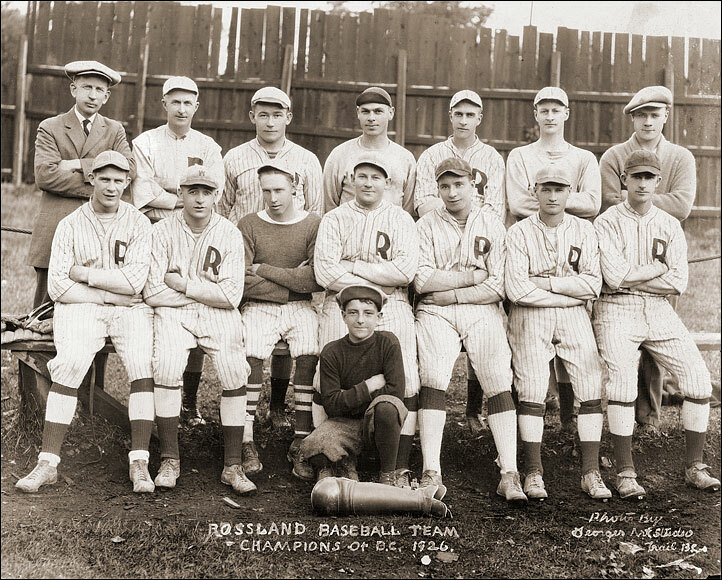 There were quite a few differences in names from those noted on the Rossland Museum photo, Gonzaga University where several played, names published in the caption under the team photo in a Vancouver newspaper and the actual names we've managed to uncover. Back row left to right: William Costello (V. Costello in the newspaper. Stello elsewhere), George Hunter, John "Puggy" Hunton (Fred Hunton in the newspaper, Huntun elsewhere), Joe Ferko, H. Marsters (Skid Masters), Don MacKenzie (McKenzie), Jack Pratt. Front row seated left to right: Frank Singer (Dutch Singer), Paul Teters (identified as Paul Peters & W. Teeters elsewhere), Lefty Cobaine (Harry Cobain), Frank Luce (Ernie Luce), Herb Rotchford (Rotsford & Rochford), William Molisky (Melisky), Leo Burke and Mascot Dutch Couture.